I got this email today, and I like rhinos, so I’m spreading the word. They have an option to donate as little as $8 a month, plus there’s options to donate one time, and you can use PayPal, your checking account, or a credit card. PLUS when you donate money, some employers will match or double the amount you donate. You’ve probably heard the grim report already: An astonishing 333 rhinos were killed illegally in South Africa in 2010–the highest rate ever experienced in the country. Ten of these were critically endangered black rhinos, of which only about 3,500 individuals still remain. Help WWF protect rhinos and other wildlife and habitats around the world from threats such as poaching–make a monthly donation today. to a secure holding facility. Free gift when you make a monthly donation to WWF in honor of rhinos. Why are so many rhinos being killed? The recent rhino crime wave is largely due to a rising demand for rhino horn, which has long been prized as an ingredient in traditional Asian medicine. Its popularity increased in Vietnam after claims that rhino horn possesses cancer-curing properties, despite any medical evidence. Today’s wildlife poachers are well coordinated and employ advanced technologies. Their sophisticated criminal networks use helicopters, night-vision equipment, veterinary tranquilizers and silencers to kill rhinos at night–attempting to avoid military and law enforcement patrols. WWF and TRAFFIC, our global wildlife trade program, are working to combat the crisis on a global scale. Locally, we support anti-poaching operations, introducing transmitters in rhino horns, facilitating regional dialogues on security and raising awareness among the public. WWF’s Black Rhino Range Expansion Project in South Africa aims to increase the overall numbers of black rhino by making breeding lands available–with the goal of reaching a national target of 5,000 black rhinos. Globally, we are focusing on reducing demand in consumer nations and stopping wildlife trafficking through such initiatives as aiding enforcement officials to detect rhino horn in transit. 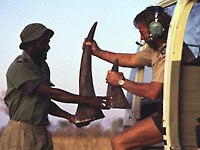 The rate of threatened wildlife poaching cannot continue unabated. We need your urgent help to protect these and other animals and their habitats. Donate today to support WWF’s global conservation work, and we’ll send you a free rhino plush as a thank-you gift. Your monthly support will help preserve and protect our world’s majestic species–like rhinos–and the habitats in which they live. Together we can help protect the future of nature for generations to come. P.S. This new year has already begun with five more rhinos lost to poaching. Help us stop poachers and other threats to nature–please support wildlife and their habitats today. A good friend of mine lives in South Africa and is huge in helping save the Rhinos! Thanks for helping the world find out about this! I LOVE rhinos! Knowing that people are killing them is super sad. This makes me so sad. Those poor rhinos. I did a story about a wildlife reserve last year and while we were on our game drive, I noticed how twitchy the rangers were when they saw an unmarked helicopter flying over. I fully support WWF’s initiative. It’s been murder here in our country. We fought so hard during the early 1980s to stop poaching and our rhino populations had started to recover… and now this.